Organizations are seeing increasing demand to deliver self-service chat experiences. Building transactional chatbots against existing enterprise systems presents significant challenges. What’s needed is a high productivity app platform to deliver chatbots using your existing teams. 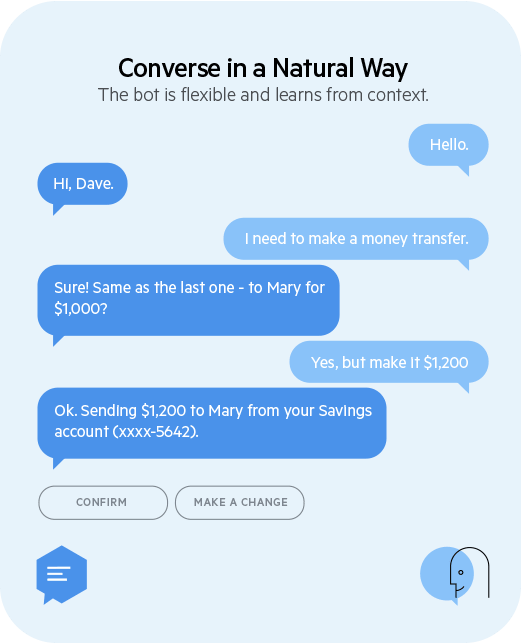 Kinvey Chat is an innovative artificial intelligence-driven channel powered by the Kinvey Platform for rapidly creating and deploying purpose-built chatbots for transactional use cases. 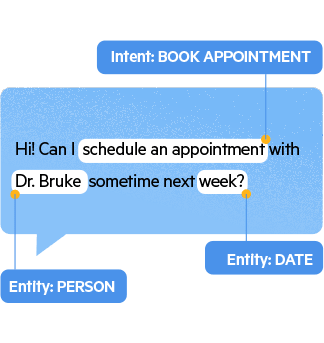 The Kinvey Chat Natural Language Engine supports dynamic training on top of existing enterprise data—like product info, company or contact names. Then it detects these entities, extracts the user intent and passes them to the Cognitive Flow. 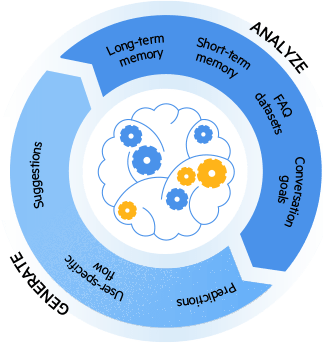 Kinvey Chat analyzes the current conversation, long-term bot memory and the goals defined by you. Then it dynamically generates the conversation flow on each user input. Kinvey Chat requests needed data from internal systems like SAP, Salesforce, Microsoft SharePoint or any API. Then it displays the response in the user's channel of choice. Delivering a superior conversational experience with text-only messages or the simple UI offered by channel vendors is a daunting task. Kinvey Chat provides rich, specially-designed UI components for conversational interaction that makes it easy to select dates, times, or items. Creating a chatbot for business processes in financial services and healthcare might lead to exposure of sensitive information, while social channels such as Facebook, Slack or Viber might fail to comply with existing data regulations. 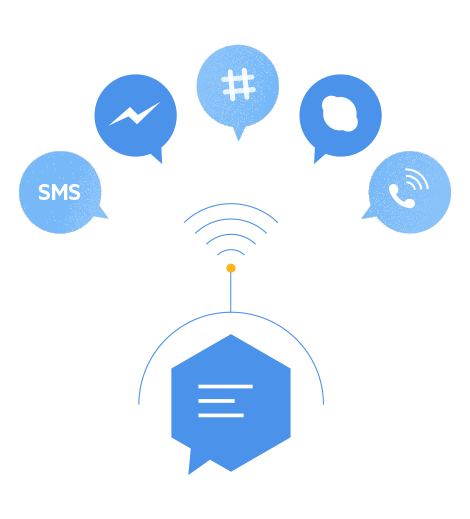 Kinvey Chat supports building your own private and secure channels for the web, iOS and Android using a set of SDKs and ready-to-use components. Training a bot to converse about existing business entities often requires duplicating data and lengthy training processes. Kinvey Chat supports dynamic training on top of existing enterprise data through web services from Salesforce, Workday, Zendesk or any other enterprise product. Designing an intelligent conversation flow requires costly development of decision trees, state workflows or slot-based algorithms using functional languages such as .NET or Java. 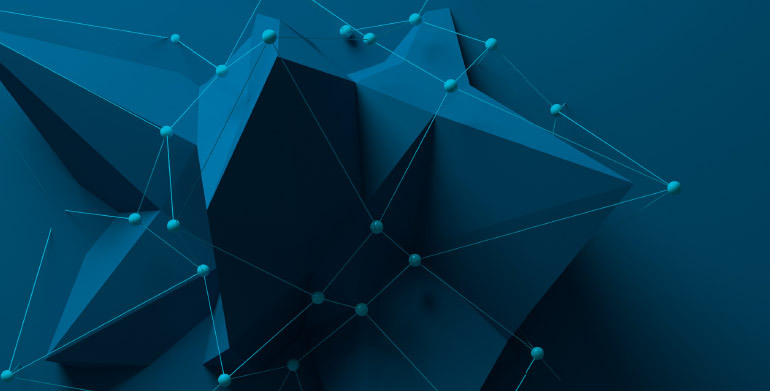 Developers using Kinvey Chat rely on declarative programming where they describe what data they want to extract from a conversation rather than how. The actual conversation flow is controlled by the cognitive algorithms of Kinvey Chat, which produce natural conversations with users. Having a natural-sounding conversation requires the bot to know and remember a lot of data about the users and their conversations. Kinvey Chat securely stores each interaction with a user in its short- and long-term memory. That can be used to suggest values in subsequent conversations or even to skip some steps. Most interactions with a bot rely on data and business logic already existing in other systems. 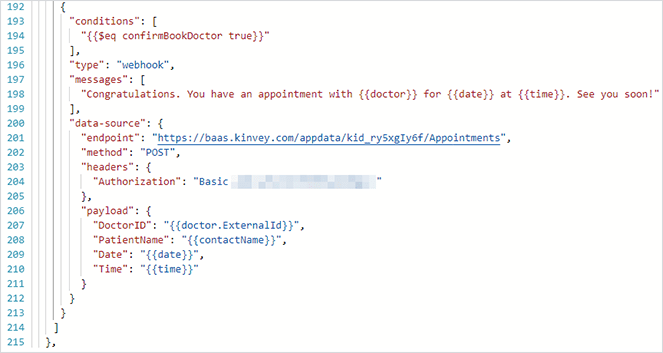 Kinvey Chat provides flexible REST API integration and samples on how to connect to your existing software infrastructure to deliver personalized user experiences. Understanding the effectiveness of your chatbot and the efficiency of conversations requires a robust tracking and monitoring solution. 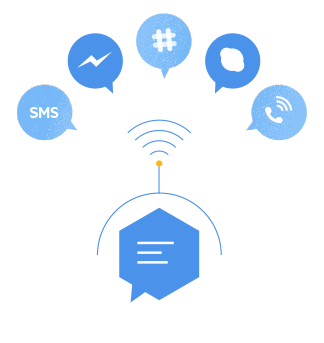 Kinvey Chat has built-in analytics for measuring user engagement, retention and conversation accuracy to ensure your chatbot is performing at its best. 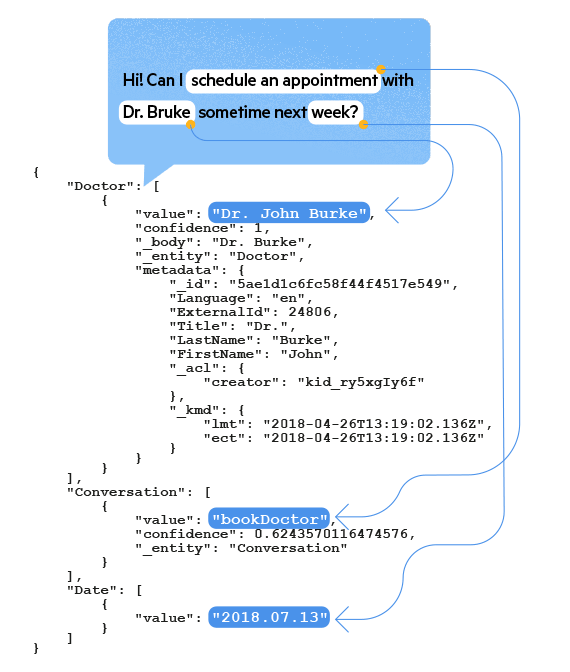 Beyond simple scheduling and reminders, a cognitive bot can recommend a healthcare specialist based on previous patient behavior and preferences. A Policy Advisor chatbot can help your customers find the right insurance policy without having to call your customer service agent. ATM Assistant helps customers find ATMs while en route to a destination, and ensures the ATM provides the desired services. Beyond simple scheduling and reminders, a cognitive bot can recommend a specialist based on previous patient behavior and preferences. Try asking about Dr. John Burke, Dr. Alcutt or Mary Cannon for a date of your choice. Just follow the bot’s instructions to book an appointment. 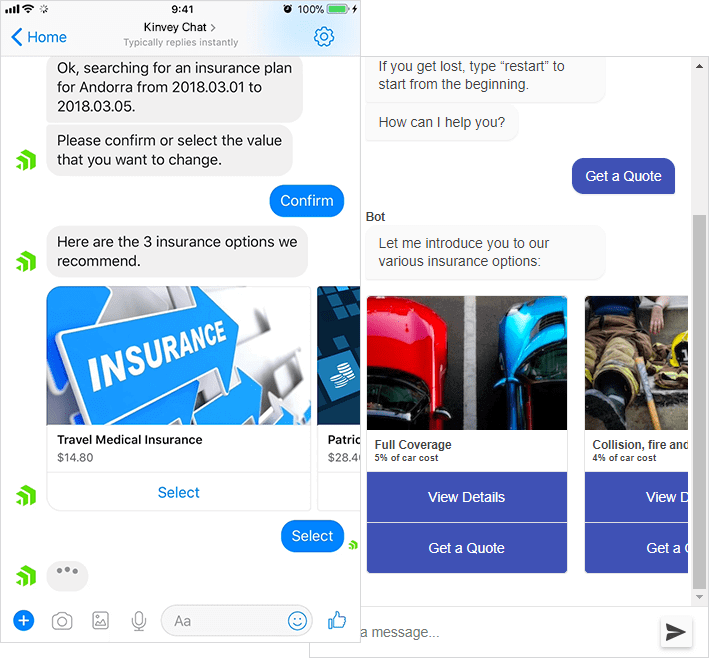 A Policy Advisor chatbot can help your customers find the right insurance policy for them without having to call your customer service agent. Just follow the bot’s instructions to sign up for insurance. Just follow the bot’s instructions and provide your current location and time of visiting. 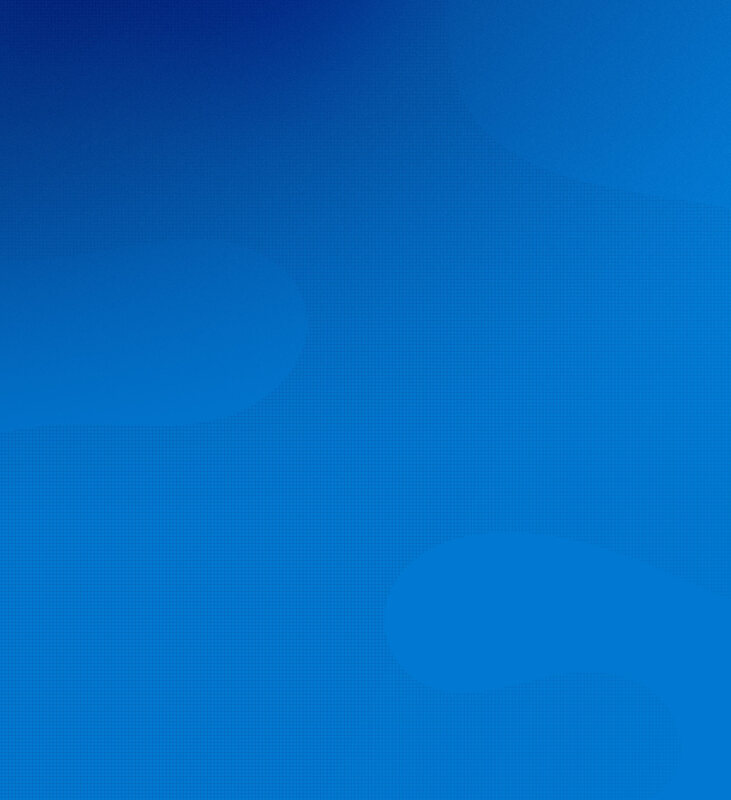 Go faster with NativeScript to deliver cross platform native apps.